news and info from Recover. Zero landfill, also called zero waste, is a popular buzzword among large corporations—and for good reason. Waste disposal costs have risen steadily in the last decade, inflating by more than 28-percent in the past ten years. 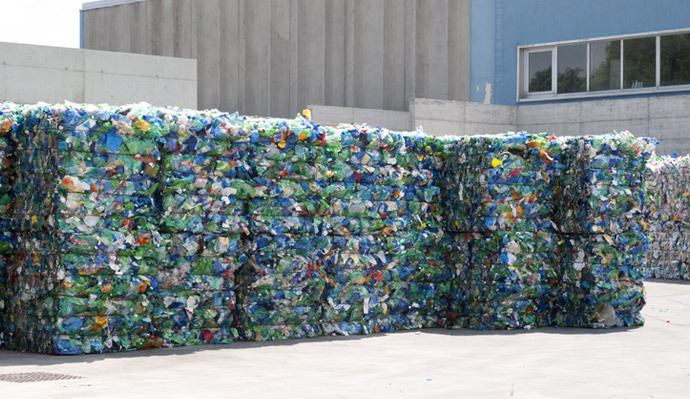 Naturally, the idea of sending less material to the landfill and recovering value from waste commodities is attractive to companies looking to decrease their environmental footprint and improve their bottom line. Of course, becoming a zero landfill facility is easier said than done. In order to be certified as zero waste, a company must divert at least 90-percent of its discarded materials out of the landfill. This can be especially difficult for companies with multiple sites, such as major grocery chains, for large manufacturers with complicated supply chains, and for distribution and warehousing centers. All of these industries produce a lot of waste and demand tailored, long-term solutions rather than quick fixes. Knowing where and how to begin can be difficult, but these four steps will help your company reach its zero waste goals. It should go without saying, but you can’t manage what you don’t measure—and this includes your trash. Businesses must begin any zero waste initiative by getting a good overall sense of how waste is generated at their facility. This includes what materials come in, how the materials are used, how many trash pick-ups are happening each week, how much volume of trash they produce, and how much trash disposal costs your company. Hard data should be the foundation of your zero waste efforts. We know this is a lot. Tracking materials can feel like a daunting task, especially for those in the manufacturing industry or the warehousing and distribution industries. At Recover, we begin every new client relationship with a comprehensive waste audit. This doesn’t only mean that we go dumpster diving for you at your location, though that is part of it. We do carefully sort through your waste stream measuring the volume and weight of each material (paper, metal, plastic, etc.) and looking for valuable commodities. Cardboard recycling, for example, is both incredibly easy and incredibly profitable, yet many companies are still throwing away used corrugated boxes. That’s just the beginning of our waste audit, though. We also track the movement of each material through your plant or other facility, looking for opportunities for diversion and making recommendations for ways to simplify your chain. Our goal is for the recycling program we create to be just as easy, or even easier, than what your employees are already doing. Unfortunately, too many companies take an “if you build it they will come” approach to their zero waste initiatives. And nothing is more wasteful or more frustrating than spending time, energy, and resources setting up a corporate recycling program that no one follows. Some of the biggest wins for manufacturing plants and other businesses seeking to become zero waste facilities come through implementing waste prevention strategies, rather than diversion techniques. The 3 R’s of sustainability—reduce, reuse, recycle—should ideally be done in that order. However, even though reducing waste generation at the source is the ideal first step, it’s also the hardest. Putting waste prevention strategies into practice takes work, coordinating the different stakeholders in your supply chain and getting everyone to agree to waste reduction practices. But the upside of this upfront work is huge. By reducing packaging and looking for ways to manufacture the same goods with less material, large manufacturers, bottling plants, warehouses, distribution centers, and other industries can reduce their raw materials costs and save money on transportation costs through greater fuel efficiency. One famous example of waste prevention is PepsiCo’s packaging reductions. Several years ago, the company debuted new Aquafina bottles that used 50% less plastic and they removed the cardboard base from their 24-bottle packaging, saving millions of pounds of used corrugated cardboard each year. Similarly, Tom’s of Maine makes sure that its packaging uses the minimum amount of raw material, and that their plastic packaging is recyclable curbside in many communities. Both of these companies have shown us that companies can strip excess materials out of the entire production chain, as well as the product lifecycle, resulting in waste reductions during production, in-store, and during consumer use. While not every business can reuse materials, many can. Challenge the disposable mentality in business by reusing materials, saving time, money, and other resources. For example, Toyota uses collapsible, durable plastic packaging modules which can be reused to ship car parts. Tom’s of Maine also focuses on reusing before recycling by grinding up plastic scraps from manufacturing deodorant canisters to form the push-up elevators inside the canister and breaks down shipping boxes, reusing every box 7 or 8 times before recycling the cardboard. Similarly, many of our clients, including paper mills, large manufacturers, and light industrial companies, have found ways to reuse materials internally before recycling the materials. Look around your facility. Do you have pallets or heavy-duty cardboard products like gaylord boxes that you can reuse internally? In the end, you’re still going to generate waste—and this is where recycling comes into play. Some recycling programs are relatively simple, such as cardboard recycling and paper recycling. Others, such as scrap metal recycling, industrial materials, and hard to recycle products like stretch film and shrink wrap, can be more difficult. It’s good to have a partner like Recover who can help you get the most value out of your recycling program. Creating awareness and providing adequate training is also essential to creating a successful zero waste initiative. By the end of training, employees should look at trash differently, seeing it not as landfill material but as a valuable resource for your company. Setting up a simple, recycle-friendly environment greatly depends on a solid, comprehensive waste and process analysis that we discussed in step one. It seems evident, but establishing easy-to-reach, clearly marked recycling bins and compactors will make your employees more motivated to divert waste for recycling. Understanding where your waste comes from also helps you maximize your efforts and focus on the largest volume areas first. For example, in most restaurant chains over half of the waste comes from the back of the house. Knowing this helps corporate concentrate their training and recycling efforts there, first, before moving on to other areas of the establishment. The bottom line: plan your approach, consider how and where your employees work, and get some “big wins” first to build enthusiasm for your program. As you can see, zero waste is about more than recycling, and can result in big wins for your organization. Fewer wasted steps, fewer wasted efforts, and greater company morale are just some of the added benefits of becoming zero waste. Long-term sustainability and zero waste is the best way for organizations to get the most value from their waste streams. Though the process can look overwhelming at first, a little planning and a willingness to start somewhere will go a long way toward your success. And remember, you don’t have to go it alone. Recover, Inc. is here to partner with you, to guide you, and to help you adjust your plan as your business evolves. We partner with businesses that want to recycle their industrial by-products, as well as government agencies, recycling centers, and mills looking for raw materials. We work throughout the United States, but our main focus is the southeastern states, including South Carolina, North Carolina, Georgia, Alabama, and Florida. We're here to help. Contact a Recover representative today.